A ski helmet has to be the most essential piece of ski safety equipment, but there are many other items designed to protect you in case of a crash or fall. We take a look at some other other options you may like to consider to help keep you safe on the slopes. "Winter sports insurance is one safety item you cannot afford to ignore"
Whilst this doesn't offer your physical protection, it will help get you out of trouble should anything go wrong. Being airlifted off the slopes is not cheap and even if you are in Europe, your EHIC is not going to pay for this. Likewise, medical bills or repatriation can soon run up a large bill and whilst an EHIC may pay some of the former, it won't cover getting you home. Travel insurance is one safety item you cannot afford to ignore. Snowboarders are far more likely than skiers to injure their arm and wrists. www.ski-injury.com reports that the incidence of fractures (broken bones) is twice as high amongst snowboarders compared to skiers - (approximately 25% of all injuries in boarders are fractures compared to 12.5% in skiers). This is because the instinctive reaction to a fall is to stretch out your hands to break a fall, and of course, the wrist can often take the brunt of the force. A wrist injury will not only severely affect your ability to board (if at all), but it will cause problems in the rest of your life - even something as simple as writing or turning a door knob will become difficult and painful. Wrist guards or protectors do offer some protection in that they will keep your wrist rigid in the case of a fall, and take some of the impact. Luke Watkins of Ellis Brigham points out that wrist guards do take a lot of space under gloves: "You need to be sure that the gloves will fit over them before you buy them. We get a lot of small ladies and children who have thinner arms and want that extra protection and find wrist guards helpful. Make sure the guards offer some rigidity to protect you, though are flexible to allow a degree of movement and yet comfortable enough to wear all day." These are also popular with snowboarders.Snowboarders, especially beginners, will get a lot of knee damage - bruised knees that swell up for instance. Regulars seem to get used to it but if you are only boarding two weeks a year on holiday then these will really help. 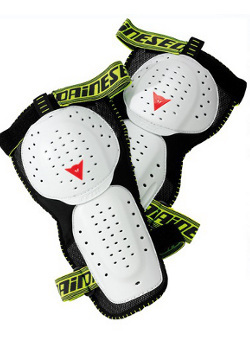 "You can get two types of knee guards: there are the hard, rigid ones, but these are getting slightly old fashioned now. There are also the squashy, squidgier ones that absorb more of the impact. The beauty of these is that they warm up against your body and mould to your shape. 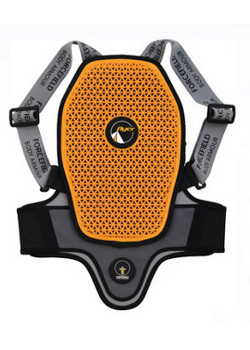 People with dodgy knees or who have had accident before love them as it gives them more protection, helps with stability and increases confidence; Parents often like to get these for snowboarding children." "9 out of 10 of the injured skiers were women, with an average age of 40." "In the UK, a boom in short skiing holidays abroad is leading to a rapid increase in knee injuries, particularly for women. More than 9 out of 10 of the injured skiers were women, with an average age of 40. Women aged over 25 are 2.5 times more likely to tear their anterior cruciate ligament than any other group." Knee protectors seem a small price to pay to avoid what could be months of physio! Back problems are common gripes of skiers and snowboarders alike. Someone not used to the effort may find the muscles strain with all the unfamiliar moves, whilst falls can jar, twist and impact upon any part of the back or shoulders. Ski-injury.com cites serious spinal injuries as uncommon, but potentially devastating. Back protectors used to be hard rigid plastic, a bit like a Turtle shell, and you can still see these for sale. But now they are just as likely to be much more bendy and may have been made with a material that is used in motorcycling clothes. It warms up against your body and after a few minutes becomes malleable. Back protectors are popular with freestyle skiers and boarders and it protects both from objects as well as awkward falls during tricks. Luke points out that "it's important to make sure your back protector is the correct length. If it isn't it will hang down or protrude over your collar and you'll end up picking up snow which you really don't want." You can also get back protectors sold as part of a traditional suit and the trick here says Luke, is to make sure it fits tightly so that it doesn't move around your body: "One bonus of a suit, is that everything is there and it is much more fitted...and much more easy to put on. Even though more expensive initially, all the protectors are there so it saves buying items individually. If you add up the cost of all the different items it will work out about the same." Again these are favoured by boarders and skiers alike. Coming in bright colours, these are basically shorts that are padded on the back and hips. One aim is to protect the coccyx which can be excruciating if knocked or landed upon and this is not an uncommon injury. Another injury the shorts may help with is a crushed vertebrae. They also protect the thighs and hips with extra padding that will be helpful in any fall and of course and keeping these areas warm will also keep the muscles flexible and less likely to cramp and strain. Luke points out that there are also some semi protective shorts that aren't so expensive but will be good for people who are learning and are not sure how much they want to invest at the moment. 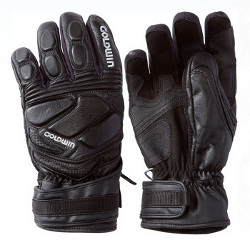 Gloves are vital for protecting hands against both cold and the sharp edges often found on skis or the edge of a snowboard. Luke points out that many women suffer with cold hands on the slopes, and mittens are a great solution for this, although you do lose dexterity. He suggests looking for gloves or mitts with an inner liner for that extra layer. Fit properly. If they are too long you won't be able to hold the skis properly and if they are too small you risk exposing some of your wrist. Finally, winter sports protective gear is a very personal choice and the most important thing is that it feels comfortable so that you can both wear it everyday and can ski or board freely in it. Whilst the softer more malleable materials vie with the harder shell like protectors, you may still prefer the protected feel of the harder material, and decide to opt for that, especially if you do a lot of racing for instance. Try it on in the shop, and decide if the weight works for you. Can you move easily? Does it make you feel more protected? Will you wear it?